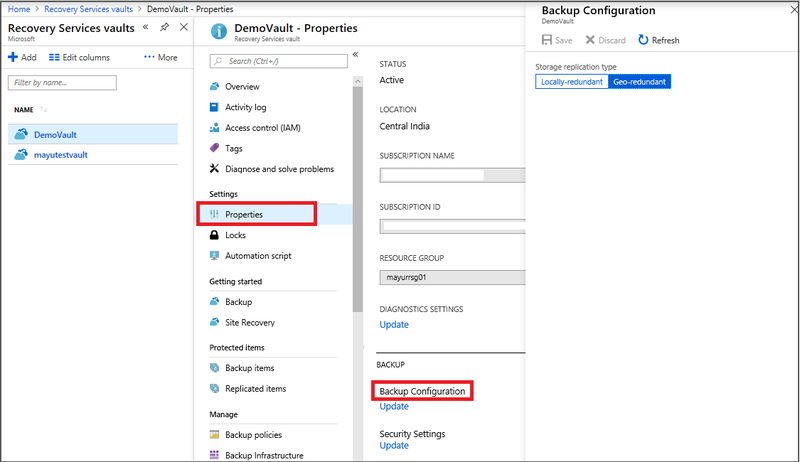 This article describes how to back up Azure VMs in a Recovery Services vault, using the Azure Backup service. Discover VMs and configure a backup policy. 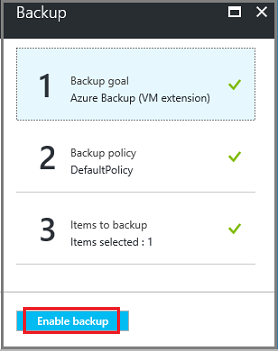 Enable backup for Azure VMs. This article describes how to set up a vault and select VMs to back up. It's useful if you want to back up multiple VMs. Alternatively, you can back up a single Azure VM directly from the VM settings. Review the Azure VM backup architecture. Learn about Azure VM backup, and the backup extension. Review the support matrix before you configure backup. Install the VM agent on the VM: Azure Backup backs up Azure VMs by installing an extension to the Azure VM agent running on the machine. If your VM was created from an Azure marketplace image, the agent is installed and running. If you create a custom VM, or you migrate an on-premises machine, you might need to install the agent manually. Explicitly allow outbound access: Generally, you don't need to explicitly allow outbound network access for an Azure VM in order for it to communicate with Azure Backup. However, some VMs might experience connection issues, showing the ExtensionSnapshotFailedNoNetwork error when attempting to connect. If this happens, you should explicitly allow outbound access, so the Azure Backup extension can communicate with Azure public IP addresses for backup traffic. In search, type Recovery Services. Under Services, click Recovery Services vaults. In Recovery Services vaults menu, click +Add. In Recovery Services vault, type in a friendly name to identify the vault. Select the Azure subscription, resource group, and geographic region in which the vault should be created. Then click Create. Monitor the status notifications in the upper-right area of the portal. After the vault is created, it appears in the Recovery Services vaults list. If you don't see your vault, select Refresh. By default, vaults use geo-redundant storage (GRS). If the vault is your primary backup mechanism, we recommend you use GRS. You can use locally-redundant storage (LRS) for a cheaper option. In the new vault, click Properties in the Settings section. You can't modify the storage replication type after the vault is set up and contains backup items. If you want to do this you need to recreate the vault. Configure a backup policy for the vault. In the vault, click +Backup in the Overview section. In Backup Goal > Where is your workload running? select Azure. In What do you want to backup? select Virtual machine > OK. This registers the VM extension in the vault. In Backup policy, select the policy that you want to associate with the vault. The default policy backs up the VM once a day. The daily backups are retained for 30 days. Instant recovery snapshots are retained for two days. If you don't want to use the default policy, select Create New, and create a custom policy as described in the next procedure. In Select virtual machines, select the VMs you want to back up using the policy. Then click OK. The selected VMs are validated. You can only select VMs in the same region as the vault. VMs can only be backed up in a single vault. In Backup, click Enable backup. This deploys the policy to the vault and to the VMs, and installs the backup extension on the VM agent running on the Azure VM. The Backup service installs the backup extension whether or not the VM is running. An initial backup will run in accordance with your backup schedule. A VM that's running have the greatest chance for capturing an application-consistent recovery point. However, even if the VM is turned off it's backed up. Such a VM is known as an offline VM. In this case, the recovery point will be crash-consistent. If you selected to create a new backup policy, fill in the policy settings. In Policy name, specify a meaningful name. In Backup schedule specify when backups should be taken. You can take daily or weekly backups for Azure VMs. In Instant Restore, specify how long you want to retain snapshots locally for instant restore. When you restore, backed up VM disks are copied from storage, across the network to the recovery storage location. With instant restore, you can leverage locally-stored snapshots taken during a backup job, without waiting for backup data to be transferred to the vault. You can retain snapshots for instant restore for between one to five days. Two days is the default setting. In Retention range, specify how long you want to keep your daily or weekly backup points. 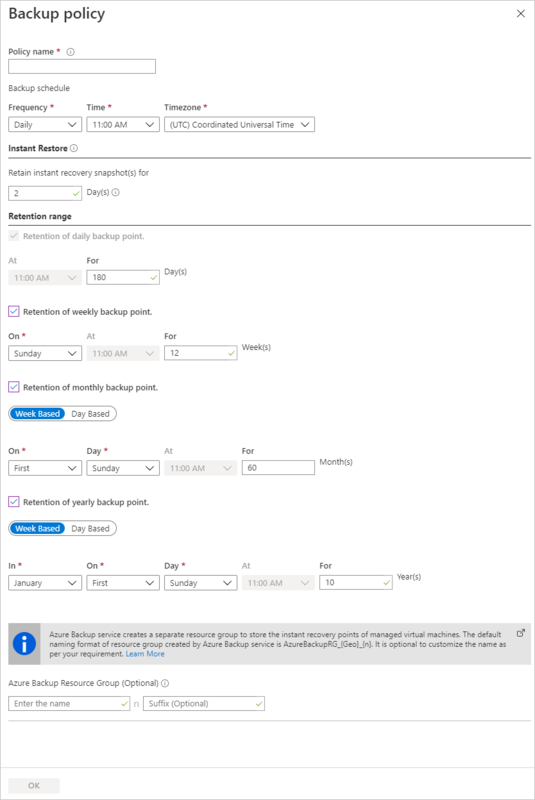 In Retention of monthly backup point, specify whether you want to keep a monthly backup of your daily or weekly backups. 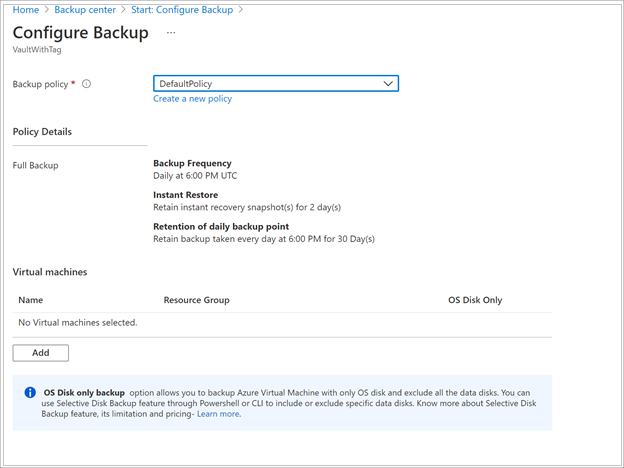 Azure Backup doesn't support automatic clock adjustment for daylight-saving changes for Azure VM backups. As time changes occur, modify backup policies manually as required. In the vault menu, click Backup items. 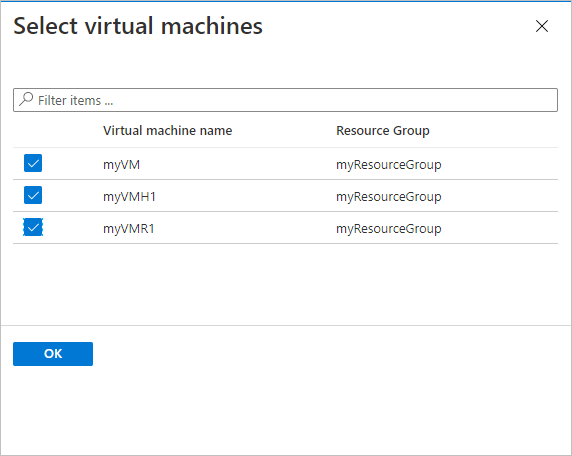 In Backup Items click Azure Virtual Machine. In the Backup Items list, click the ellipses (...). In Backup Now, use the calendar control to select the last day that the recovery point should be retained. Then click OK.
Monitor the portal notifications. You can monitor the job progress in the vault dashboard > Backup Jobs > In progress. Depending on the size of your VM, creating the initial backup may take a while. Azure Backup backs up Azure VMs by installing an extension to the Azure VM agent running on the machine. If your VM was created from an Azure Marketplace image, the agent is installed and running. If you create a custom VM, or you migrate an on-premises machine, you might need to install the agent manually, as summarized in the table. Windows 1. Download and install the agent MSI file. 2. Install with admin permissions on the machine. 3. Verify the installation. In C:\WindowsAzure\Packages on the VM, right-click WaAppAgent.exe > Properties. On the Details tab, Product Version should be 2.6.1198.718 or higher. If you're updating the agent, make sure that no backup operations are running, and reinstall the agent. Linux Install by using an RPM or a DEB package from your distribution's package repository. This is the preferred method for installing and upgrading the Azure Linux agent. All the endorsed distribution providers integrate the Azure Linux agent package into their images and repositories. The agent is available on GitHub, but we don't recommend installing from there. If you're updating the agent, make sure no backup operations are running, and update the binaries. The backup extension running on the VM needs outbound access to Azure public IP addresses. Generally you don't need to explicitly allow outbound network access for an Azure VM in order for it to communicate with Azure Backup. If you do run into difficulties with VMs connecting, or if you see the error ExtensionSnapshotFailedNoNetwork when attempting to connect, you should explicitly allow access so the backup extension can communicate to Azure public IP addresses for backup traffic. Access methods are summarized in the following table. Set up NSG rules Allow the Azure datacenter IP ranges. Instead of allowing and managing every address range, you can add a rule that allows access to the Azure Backup service using a service tag. Learn more about service tags. Services tags simplify access management, and don't incur additional costs. Deploy a proxy Deploy an HTTP proxy server for routing traffic. Provides access to the whole of Azure, and not just storage. Granular control over the storage URLs is allowed. Single point of internet access for VMs. Set up Azure Firewall Allow traffic through the Azure Firewall on the VM, using an FQDN tag for the Azure Backup service Simple to use if you have Azure Firewall set up in a VNet subnet. You can't create your own FQDN tags, or modify FQDNs in a tag. If your Azure VMs have managed disks, you might need to open an additional port (8443) on the firewalls. If an NSG manages the VM access, allow outbound access for the backup storage to the required ranges and ports. In the VM properties > Networking, select Add outbound port rule. In Add outbound security rule, select Advanced. In Source port ranges, enter an asterisk (*) to allow outbound access from any port. In Destination, select Service Tag. From the list, select Storage.region. The region is where the vault, and the VMs that you want to back up, are located. In Destination port ranges, select the port. In Priority, specify a priority value less than any higher deny rules. If you have a rule that denies access, the new allow rule must be higher. For example, if you have a Deny_All rule set at priority 1000, your new rule must be set to less than 1000. Provide a name and description for the rule, and select OK.
You can apply the NSG rule to multiple VMs to allow outbound access. This video walks you through the process. The Azure VM should route all HTTP traffic bound for the public internet through the proxy. The proxy should allow incoming traffic from VMs in the applicable virtual network. The NSG NSF-lockdown needs a rule that allows outbound internet traffic from the proxy VM. Run PsExec.exe -i -s cmd.exe to run the command prompt under a system account. Run the browser in system context. For example, use %PROGRAMFILES%\Internet Explorer\iexplore.exe for Internet Explorer. On Windows machines, in the browser settings, specify that a proxy should be used. If you're currently using a proxy on a user account, you can use this script to apply the setting at the system account level. $obj = Get-ItemProperty -Path Registry::”HKEY_CURRENT_USER\Software\Microsoft\Windows\CurrentVersion\Internet Settings\Connections"
$obj = Get-ItemProperty -Path Registry::”HKEY_CURRENT_USER\Software\Microsoft\Windows\CurrentVersion\Internet Settings"
Allow incoming connections in the proxy settings. In Windows Firewall, open Windows Firewall with Advanced Security. Right-click Inbound Rules > New Rule. In Rule Type, select Custom > Next. In Program, select All Programs > Next. Set Local Ports to Specific Ports. Set Remote port to All Ports. Finish the wizard and specify a name for the rule. On the NSG NSF-lockdown, allow traffic from any port on 10.0.0.5 to any internet address on port 80 (HTTP) or 443 (HTTPS). The following PowerShell script provides an example for allowing traffic. Instead of allowing outbound to all public internet addresses, you can specify an IP address range (-DestinationPortRange), or use the storage.region service tag. Set-AzureNetworkSecurityRule -Name "allow-proxy " -Action Allow -Protocol TCP -Type Outbound -Priority 200 -SourceAddressPrefix "10.0.0.5/32" -SourcePortRange "*" -DestinationAddressPrefix Internet -DestinationPortRange "80-443"
You can set up Azure Firewall to allow outbound access for network traffic to Azure Backup. Learn about deploying Azure Firewall. Troubleshoot any issues with Azure VM agents or Azure VM backup.